Maria of Denmark’s new Olivia Oversized Tee… and Cake Espresso PANTS! Well hi there! I’ve got two new makes to talk about today – both of which are patterns I was lucky enough to test! First up, Maria of Denmark’s brand new Olivia Oversized Tee. 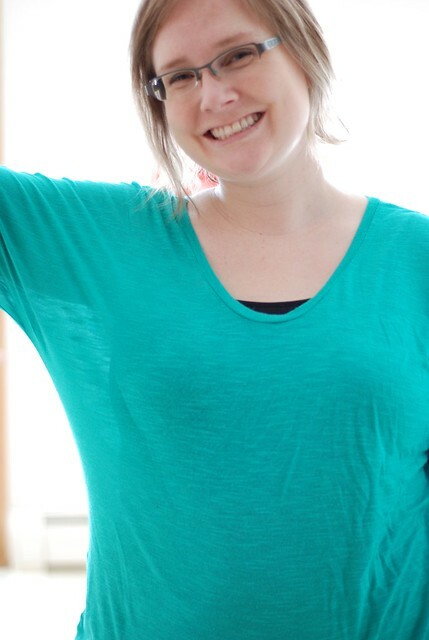 It’s a loose-fit kimono sleeve top with a snug band at the bottom. It’s really fast to sew, and has a nice rounded v neckline! Now, I love the way this top feels.. but looking at the pics I probably could have gone down at least a size! I made it in slubbed tissue knit which is slightly sheer. Because it’s sheer, I have to wear a cami underneath… but because the fabric is so fine it catches on the cami underneath and clings in odd places. Next time I think I’ll use a medium-weight fabric with some drape, and I think it will be perfect! I only had 1m of this fabric, so I had to piece the back and cut each half slightly off grain. If you had narrower hips or cut the shorter sleeve version, you’d be just fine with 1m. Can I just say how much I LOVE the DSLR and 35mm lense that my Dad lent me? This pic was taken in the middle of a long dark hallway on an overcast day, and it still looks full of light! I didn’t alter a thing about any these photos – they are straight out of the camera! 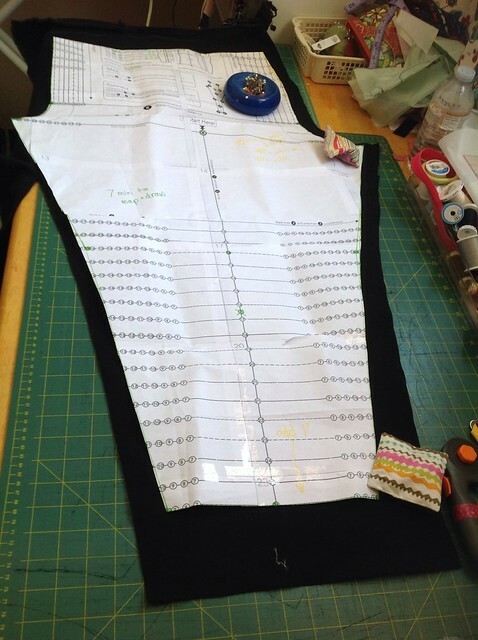 Now for the next project – skinny pants made from the Sewing Cake Espresso leggings pattern! I tested this pattern back in the summer, and I’ve made … oh man, at least 8 pairs since then? 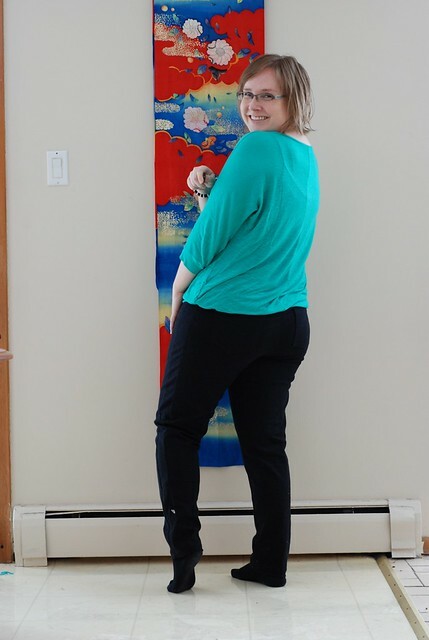 I’d been wondering if the draft-your-own-leggings pattern would make a good starting point for pants, and the answer is YES! 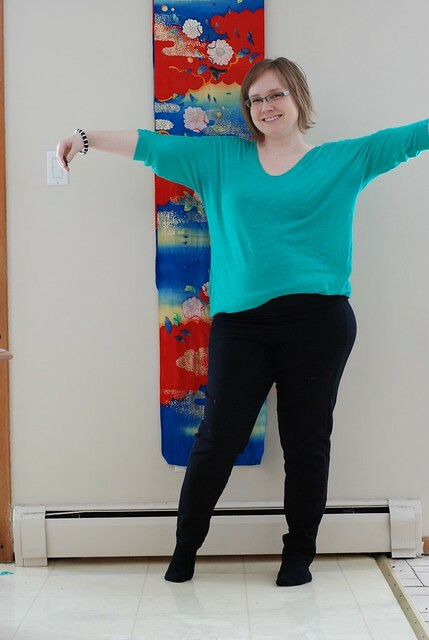 Espresso leggings are made with just one pattern piece, with no side seam. To start off, I cut one side of the pattern, then I slide it about 1” over to add an inch of ease all down the leg. I also added some ease below the knee so that they wouldn’t be skin tight at the ankle. Basically, it looks like this! Now, the fabric is a really important factor here. I use a very stretchy twill with at least 30% stretch. These pants really wouldn’t work without it! That said, when I sewed them up, they were TIGHT! Time for a quick save: Tuxedo stripes! I sliced down the side, and spliced in a 2.5” strip. I figure that after the seam allowances, it ended up adding about 1.5” of ease to the pants. Next time I’ll add that ease in when I cut out the fabric. I have to say, I’m really pleased with these pants! They are an almost identical knock-off of the first pair of skinny pants I bought (back in Japan, when I wouldn’t dream of wearing skinny pants except to tuck into high boots!) I’m not convinced that it’s the most flattering silhouette on me, but come on, who really cares?